The extremely cost-effective compact controls of the sysWORXX Automation Series combine simplicity and outstanding performance. Thereby the compact design with its high IO density not only saves valuable space in the switching cabinet, but also guarantees best price-performance ratio. Dividing the system into smaller yet intelligent units in spite of large centralized controls benefit in money's worth. Integrated networking via CANopen makes easy the connection of operator panels, visualization units, drives and other groups of peripherals. Access distributed process data as easy as local variables. The integrated CANopen network management automates the network configuration and lets you concentrate on the essentials. The sysWORXX gateway modules make easy the connection of distant networks. Substructures in the field bus level allow for separation of high-speed line bus for process IO and low-priority management bus. Intelligent gateway functionality simplifies the access to subordinated nodes significantly. Take advantage of most convenient IEC 61131-3 compliant programming utilizing all five programming languages. Thereby a comprehensive library provides complete CANopen services for master and slave devices. The seamless integration of CANopen into the programming system lets you solve even complex automation tasks more efficiently. This makes the sysWORXX Automation Series ideally suited for the distributed control of machines and systems in autarkic units or cells with integrated intelligence. Here again, CANopen enables real-time communication between the system units and guarantees easy expansion of the system. Connect, configure and you are done! Due to its simplicity sysWORXX modules expand your system just as your application grows. That helps you to achieve your objectives faster and yet provides most economical solutions. Simply connect, configure and you are done. Here too, the perfect interaction of CANopen and IEC 61131 programming ease your work. New process parameters are available as a set of new network variables. Just extend your modular application software by the new functions needed. The new peripherals are configured automatically to make sure your system is in a consistent condition at startup. Access to sysWORXX controls is provided via CAN-bus or Ethernet. This not only enables easy update of your control application, but also delivers insight to your distributed automation system. Comprehensive debugging functionality as well as offline simulators reduces the time of commissioning significantly. 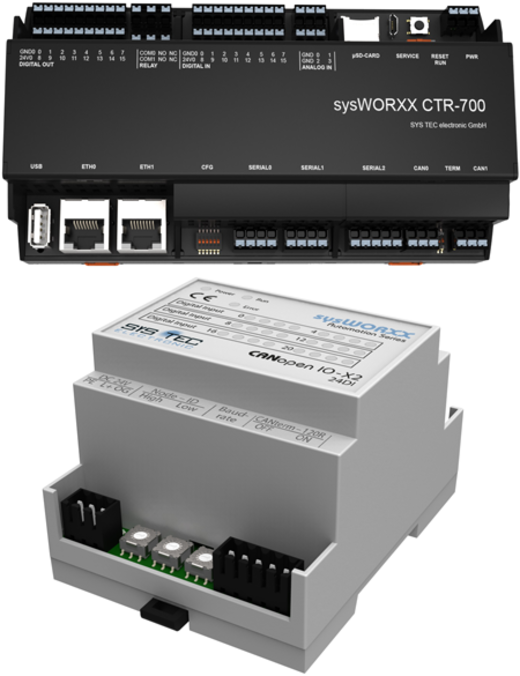 The sysWORXX CTR-700 in an compact controller that supports simultaneous execution of IEC 61131-3 PLC programs and Linux applications. It is possible to share data between the PLC program written in IEC 61131-3 and other native Linux applications implemented in C/C++. A comprehensive IEC 61131-3 function block library provides access to all communication interfaces. Higher-layer protocols such as CANopen are available as well. The built-in CANopen manager services enable an easy integration of other CANopen modules and even allow distributing the application task to multiple networked devices. The communication and data exchange with other devices via Modbus protocol is supported by extended Modbus/TCP function blocks. The sysWORXX CANopen I/O devices are outstanding by its flexibility and ability to be used for a wide range of applications. Thereby all devices of the sysWORXX Automation Series speak a common language – CANopen. Large or compact controllers, machine or process automation – the sysWORXX Automation Series covers a wide spectrum of use. The sysWORXX I/O devices are just the right completion to existing CANopen systems and expand the possibilities of distributed control systems easily. Today, complexity of automation should be limited to the application. Thereby the automation system is meant to be a solution and should not bring any additional complication or even increase complexity. The sysWORXX Automation Series was designed to solve complex tasks in a simple way. Harmonizing software tools for configuration and analysis eases the task of implementation, test and commissioning of your application. Due to its simplicity the sysWORXX I/O devices can be used without special know-how. That helps you to achieve your targets faster yet provides most economical solutions. Simply connect, configure and you are done. Accompanied by our powerful software tools, the sysWORXX devices achieve their full potential and allow you to implement applications of best performance and flexibility. Thereby the seamless integration into existing CANopen structures is a major advantage. The sysWORXX Automation Series simplifies troubleshooting. Plug & Play mechanisms register and configure replacement modules for instant use. Thanks to separated terminal blocks, wiring remains unaffected. Being able to quickly exchange the automation components minimizes downtime considerably. Helpful diagnostic options let you find and identify errors quickly. LEDs indicate the bus status as well as each I/O state. Internal diagnostic measures reduce the possibility of undiscovered errors and ensure the device is ready for operation when it goes online. In addition all sysWORXX devices send emergency messages, precisely indicating the type of error that occurred. An error state can be assigned to each process output to make sure the system is safe in case of error.